Happy new year, everyone! I hope 2012 has been treating you kindly thus far. I feel quite vaguely optimistic about this new year. Okay, so I've had to work mostly through the Christmas and New Year, with no signs of things easing up for another few weeks. Incessant overtime does not suit my indolent nature. And Simon has just gone off on a nearly-7-week holiday without me. Sad! But these are first world problems, really. Particularly when, lately, I've come to realise that I'm actually quite content, most of the time. I don't have everything that I want... and yet I have so much. So often, bliss can be found in simple things. 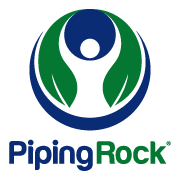 Like colleagues whose company you relish, even though you sometimes yearn for a career change. Like having money in the bank, even when you don't earn much. Like having a roof over your head. Like being with people who feel like home. Like a warm meal when you're hungry. 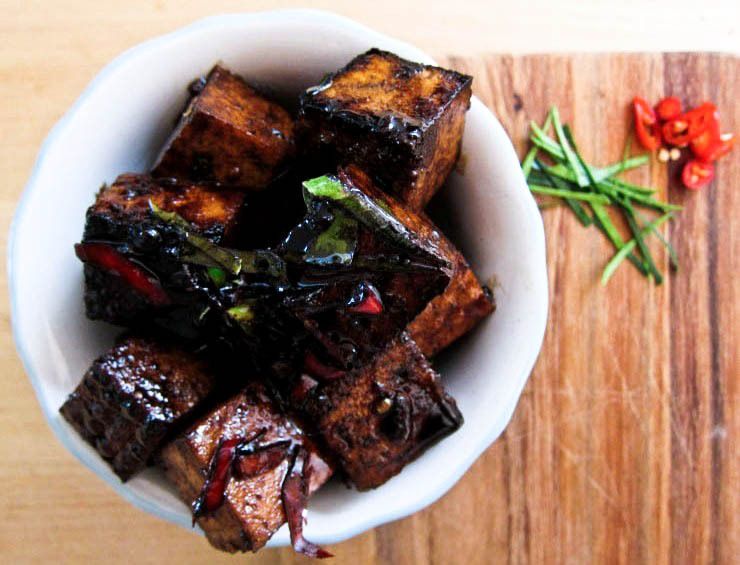 Like sharing this spicy-tangy chilli kaffir tamarind tofu dish with Simon on New Year's Eve. I like it. He likes it. I like that he likes it. It may not have the prettiest appearance, but the flavour hits you, and it hits you good. Can you handle it? I couldn't resist reaching for the fish sauce with this one. However, you can easily make it vegetarian and vegan-friendly by substituting with soy sauce plus an extra pinch of sugar. Either way, the flavours will be big, bold, bodacious. Enjoy. Slice chilli into thin rings. 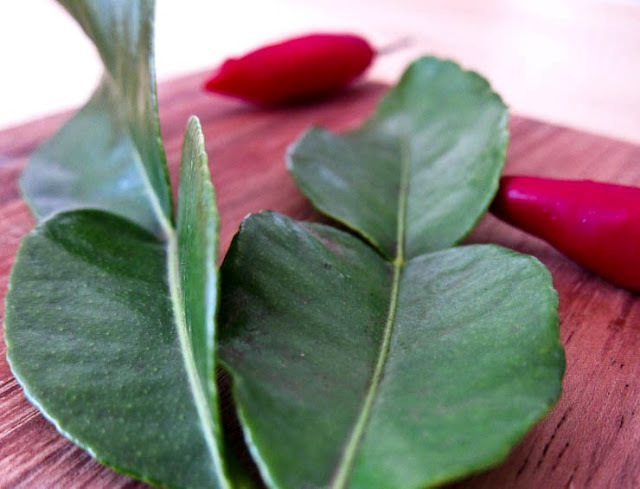 Slice kaffir lime leaves into thin strips, discarding the tough middle stem. Mix tamarind concentrate, fish sauce and sugar in a bowl. Throw in most of the chillies and kaffir lime leaves, setting aside a pinch of each for garnishing later, if you like. Mix well to form a marinade. 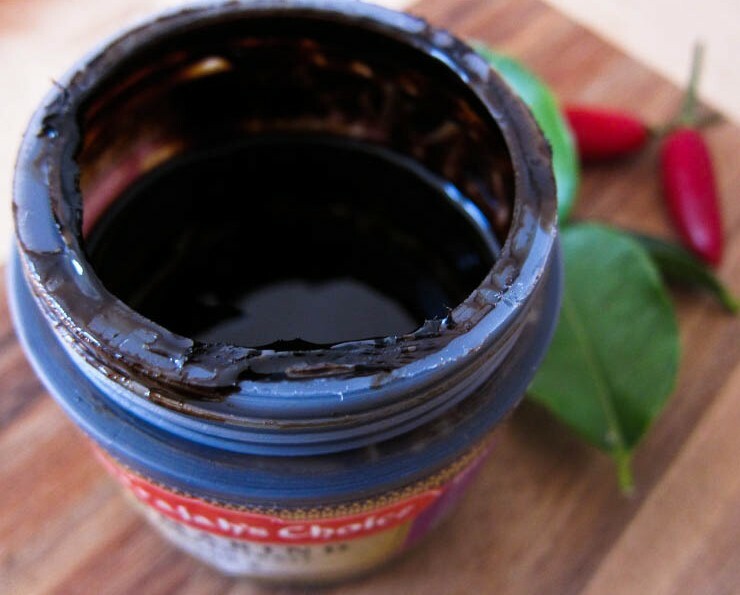 If you're not into super sour flavours, taste as you add in the tamarind concentrate to reach your preferred balance. Time for the tofu to join the party. Cut the tofu into 2.5cm/1" cubes and tumble them merrily through the marinade. Leave it for 15 minutes. Heat up some oil in a frying pan over medium high heat to cook the tofu cubes. To really sear them, add the tofu cubes while reserving most of the marinade intact in the mixing bowl. Stand back - the tofu might sizzle and spit. Once they develop a nice dark crust on their bottoms, pour in the marinade and let everything cook over medium heat, stirring and turning occasionally, until the sauce is reduced and clings lazily to the tofu. Garnish with any leftover fresh chilli and kaffir lime leaves, and serve immediately. Pair it with rice and salad for a full meal. Ooh loving those flavours! Yeah I reckon I could handle this! Yummo! This has my mouth watering as I read. This would taste really good!!! Thanks Anna! My chillies were pretty spicy and there's that sour hit from the tamarind concentrate, so it may not be for everyone, but it's my kind of thing. Thanks Michelle, it's the kind of dish that comes on strong, but we really enjoyed it! Yum! I'm doing a version of this tonight with pickled vegetables and ginger! Fingers crossed this works! That looks like drool factor. I hope it works, msihua! This looks so good! Time to get some more tofu. This dish looks so yummy! I've really be interested in giving tofu a try recently, but didn't really know what to do with it. This recipe sounds great! 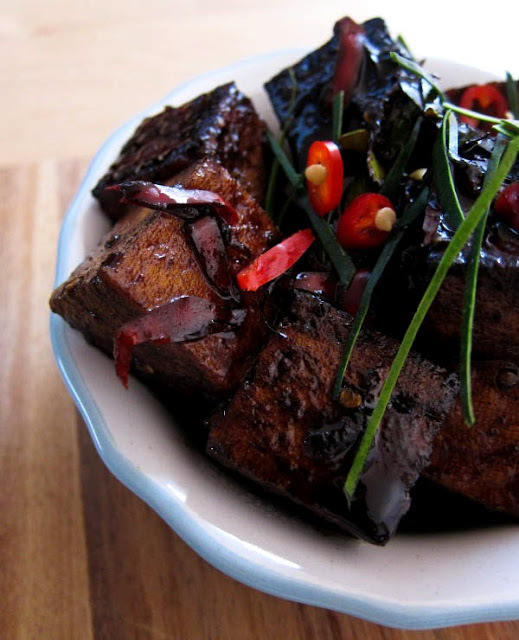 I love kaffir leaves, I love tamarind, chili and tofu... this recipe is for me! I love your photos. Happy New Year! Yum! I am always on the lookout for new and exciting ways to make tofu, as it is one of the foods i eat most often as a gluten free vegetarian, so this is a great new idea. Thanks Baltic Maid, happy new year to you too! Thank you Sissi. Happy new year! I've been cooking tofu a lot recently and this looks insanely delicious!! Really? I think it has a stunning appearance. Rich, flavourful and full of depth. I think I could handle it :) Gorgeous! Yum! This tofu dish sounds and looks fantastic - love the combination of flavours...All the best for the New Year! Happy New Year. This tofu dish looks very delicious. I love this idea and I think I should grow some Kaffir lime in my garden to enjoy more Kaffir lime cooking more often. Thanks To Food With Love! Thanks ameanderingmango, best wishes to you too! Thanks Zoe. I would love to have a kaffir lime tree one day... sigh. Funny, I was just thinking about the bliss of simple things this morning as I was hitting the snooze button and cuddling in bed with my sweet dog and cat!! Anyway, I do think this tofu dish is plenty attractive. Looks and sounds delicious! Thanks Yas, it's certainly a wonderful feeling. Oh squeeee, Trix! 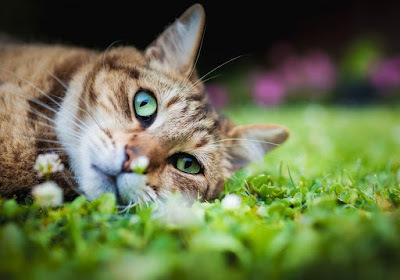 What a gorgeous moment with your pets. Agnes - exactly. It's outrageous! Hmmph. This looks great but I may use a little less chilli - love your new year reflections - contentment is a great achievement in this day and age! Omg, this tofu looks so good!!! Happy New Year to you! This looks so delish Leaf, I have never been a fan of tofu, terrible vegetarian i know! But this looks like something I have to try. People say that the flavour infuses if it is left over night. . Maybe I'll try that. Looks fabulously delicious...will definitely give it a go. So easy and quick to make too!